Molini Spigadoro Rice Flour stems from the desire to offer ATTRACTIVE and WHOLESOME quality products cultivated in Italy: two native varieties of Venere Black Rice and Red Rice packed with flavour, fragrance, nutrients and colour nuances. Rice flour is obtained by finely milling the grains of this totally gluten-free cereal which is why it is used in many recipes as a substitute for wheat flour, to prepare dishes for anyone suffering from gluten intolerance or coeliac disease. Since it does not rise well, it is advisable to mix 20% of it with other types of flour when making oven-baked products, cakes and fresh pasta that are easy to work, light and digestible. 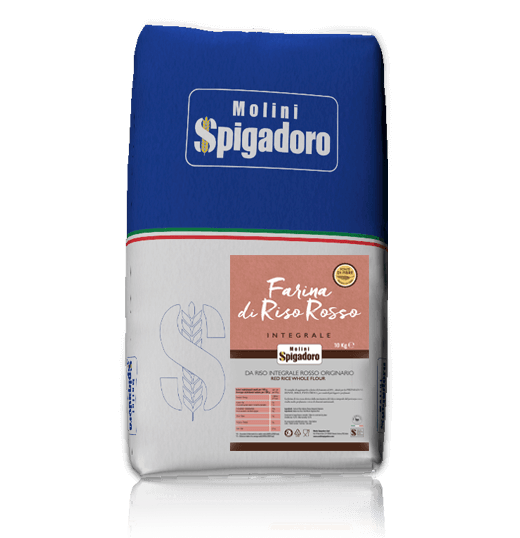 The Rice Flour Mix was created by Molini Spigadoro to make it suitable for bread-making. Exclusive mixes combine rice flour and Type 1 flour, wheat germ and malted wheat flour to promote improved leavening without sacrificing any of the properties, colour, intense flavour and fragrance. These special ingredients, together with the nutritional properties of Type 1 flour, make sweet and savoury oven-baked products and fresh pasta easy to work, light and highly digestible. Venere Black Rice Flour comes from a variety of wholegrain rice, grown exclusively in the Italian Piedmont region in the Grange wetlands of Vercelli by the Filiera Riso Venere, certified by the Sapise Farming Cooperative which guarantees its origin, traceability and quality (Authorisation No. 801). Venere rice has many beneficial health properties thanks to the water-soluble vitamins, mineral salts and fibre that it contains which make it an ideal food for a healthy diet. The presence of antioxidants, known as anthocyanins, combats the action of free radicals while the absence of gluten ensures that it is easy to digest. 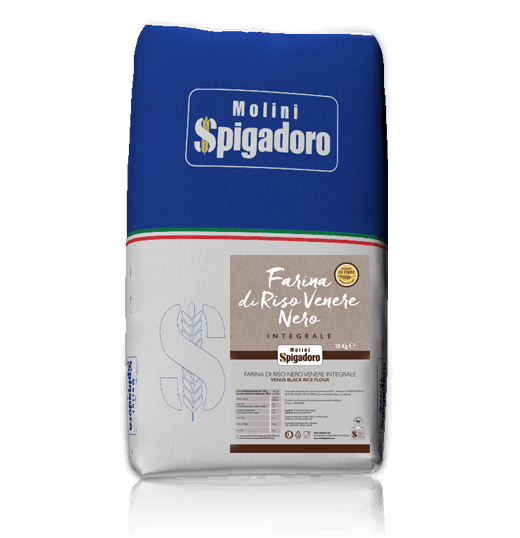 Molini Spigadoro Venere Black Wholegrain Rice Flour is obtained from grinding black rice grains: aromatic, scented and unmistakeably dark grey in colour. 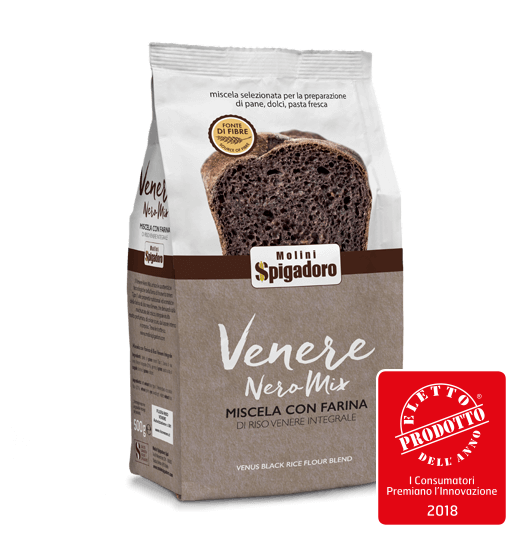 Molini Spigadoro Venere Black Flour Mix combines the technological characteristics of Type 1 common wheat flour and the nutritional properties of black rice flour for improved leavening without sacrificing any of its colour, intense flavour and fragrance. Red Rice Flour is obtained by grinding whole grains with red husks and is very fragrant, aromatic and packed with nutrients. Red rice has an elongated grain with a characteristic red colour due a type of antioxidant called anthocyanin which is important for combating cellular ageing caused by free radicals. It is also packed with natural nutrients, such as fibre, vitamins, mineral salts and proteins while it is gluten free. 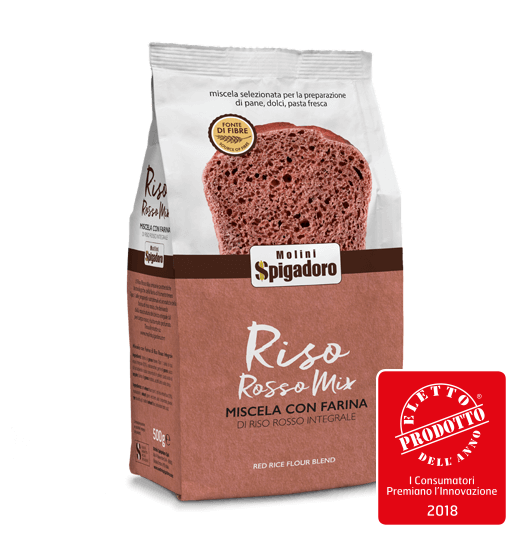 Molini Spigadoro Red Rice Whole Grain Flour is obtained by grinding red rice grains, cultivated exclusively in the Italian region of Piedmont in the Grange wetlands of Vercelli. The flour is scented, aromatic and characteristically red in colour. Molini Spigadoro Red Rice Flour Mix combines the technological characteristics of Type 1 common wheat flour and the nutritional properties of red rice flour with a touch of creativity… beetroot concentrate!